We all take pride in cleaning our cars ourselves, maybe adding a layer of wax and having the paint look clean and shiny. Problem is, every time a car is washed, the finish is slightly damaged…. Each time a sponge, brush or even a cloth is pushed along the surface, tiny scratches are left behind (ever notice the swirls in your paint?) After multiple washes the number of tiny scratches has multiplied, making the paint look a little duller. Additionally, the detergents in soap or cleaning agents can cause a deterioration in the surface of the clearcoat. Adding a layer of wax can help the appearance in the short term, but the luster wears off as the wax loses it’s effectiveness over time. The answer? Polishing. When done correctly, polishing smoothes the surface of the clearcoat, eliminating those multiple smaller scratches. In fact, polish is very mildly abrasive and effectively removes a very thin layer of the clearcoat, which in turn makes the surface flatter and therefore more reflective (shiny!). 1. Clear Coat – as the name implies, it is a clear paint and protects the layers below it. There are multiple layers of Clear Coat on modern cars. 2. Base Coat – this is the paint, i.e. the layer which gives the car its color. A scratch is the result of paint or clearcoat having been removed. Shallow scratches are generally created when someone brushes against the surface or when the car is being washed. Deep scratches are those where something sharp or heavy has gouged the Clear Coat, right through the paint and into the promer and body panel – imagine a key or nail being scraped along the side of a car. Even if you keep your car from being scratched, there are many other ways the paint can be damaged. Bird droppings, acid rain, tree sap and even the lime in hard water will all ‘eat away’ at the surface of the clearcoat if left untreated. 1. Prevention: A good wax or sealant will minimize the effects of contaminants and provide protection for the surface of the clear coat. Without the protection of wax or sealant, the surface of your car is at the mercy of the elements and will deteriorate relatively quickly. Paint will also ‘dry out’ over time and start getting cracked – again, wax and sealant helps to proevent this. 2. Clay Bar: A clay bar is a maleable, putty-like substance and is designed to lift contaminants such as brake dust, flakes of metal and grit away from the surface of the paint. 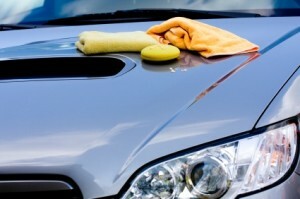 Claying the car every 6 months will remove the heavier contaminants and reduce the damage to your car’s surface. 3. Compounding and Polishing: Both involve removing a tiny layer of Clear Coat and require skill and experience to do properly (without causing more damage). Compounds are simply a very agressive form of polish and will remove more of the Clear Coat, but do not leave a totally smooth finish – that is the job of the polish. Why does a smooth finish shine? If the surface is perfectly flat and even, the paint will sparkle and give a mirror effect. However, if the paint is uneven due to scrathes and other damage, the light is reflected in multiple directions, giving the paint a dull appearance. Your car can be compounded and polished a number of times, but remember each time it happens, the Clear Coat is thinned a tiny amount. So depending on the agressiveness of the Compount and pad used, if care is not used, the base coat could be damaged over time.